Small hive beetles are indigenous to Africa, but have been damaging beehives in the United States and Australia for several years. Rowan Sprague, a University of Virginia fourth-year student, wants to stop the half-centimeter pests. Sprague, 22, of Richmond, a civil and environmental engineering major in the School of Engineering and Applied Science, received a 2012 Harrison Undergraduate Research Award to explore ways of trapping the beetles and keeping them out of the beehives. "As one of the main pollinators of crops, honeybees are in high demand in agriculture," Sprague said. "But their colonies are being weakened by this invasive and parasitic insect. I am researching the optimal structural design of a trap to keep hive beetles out of the beehives." Hive beetles destroy bee larvae and damage the honey, according to Sprague. She said the more aggressive African bees are better able to fend off the beetle than their North American and Australian cousins. The beetles can destroy a weak, thinly populated hive. In a stronger hive, worker bees are designated as guards to segregate the invasive hive beetles and keep them from the bee larvae and honey, but this also divides the hive's resources. "While small hive beetles usually don't kill a stronger colony, weaker colonies can be significantly harmed by them," Sprague said. "Small hive beetles are also an added stress to the long list of troubles that honeybees face today, such as pesticide use, pathogens, viruses and varroa mites." Sprague is seeking to build a trap that will capture the beetles and prevent them from entering the hive, so her research explores how engineering and agriculture are related. "The more I learn about honeybees, the more fascinated I am with them and the more I want to help combat their decline," she said. She learned about mathematically modeling honeybee behaviors – such as developing a program to simulate a bee colony when it swarms – at U.Va. 's "Bee School," taught by Hans Christian Gromoll, an associate professor in the Math Department. The course, offered in the 2011-12 academic year, was supported by the Mead Endowment. She has already designed three unsuccessful traps, and said she has decided that the beetles do not follow a direct path into the hives. "Although there were fewer beetles in my hives with traps on them than those without traps on them, none of my traps had actually caught any beetles," she said. "While I still believe that they have a very strong sense of smell, I think they are smarter than I thought they were or need a stronger incentive to draw them into my trap." Paxton Marshall, a professor in the Department of Electrical and Computer Engineering, described Sprague as "an outstanding student and a promising young researcher. "She is taking an innovative approach to a serious problem threatening honeybee populations," he said. "She is a model example of engineers making a difference." Sprague was an intern and leader with the Morven Kitchen Garden Project, a one-acre educational plot for studying sustainable agriculture techniques and food systems. She established a community-supported agriculture program for students and faculty members. She is a sustainable food intern at the International Residence College, responsible for organizing, advertising and running community-building events aimed at raising awareness for local food and supporting local food systems. She is the academic achievement chair of the U.Va. Chapter of the American Society of Civil Engineers, a steering committee member of the U.Va. Food Collaborative and a volunteer English-language tutor. Sprague is still seeking her optimal trap design and she plans to meet again with some of her professors, then design and build a fourth trap. "If I do create a successful trap, I will share it with area beekeepers so that they, too, can recreate and implement it," she said. She has applied for a Fulbright Research Grant to study ecological engineering with a professor in New Zealand to research ways to manipulate agricultural systems to benefit honeybee populations. "I'd be approaching this research primarily focused on the ways agriculture can benefit honeybees, instead of the ways honeybees can benefit agriculture," she said. "My research at U.Va. has been pivotal in directing my future plans. Now I am seriously considering a career exploring the relationship between honeybees, agriculture and engineering. Without my research projects, my academic trajectory would never have been shaped thus. "I do not see the world as a giant problem to be fixed, but rather as a multitude of opportunities to learn," she added. "For me, research is a way to study patterns, relationships and anomalies in the environment and in societies with a curious, yet analytical mind." 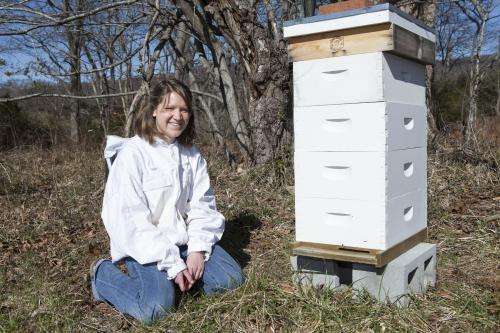 Rowan said her research has led to connections with diverse groups of people within U.Va., around Charlottesville and across the U.S.
"I've enthused about honeybees and debated agricultural issues with U.Va. students, faculty and staff, taught a lesson about bees and pollination to a Piedmont Virginia Community College horticulture class and discussed honeybee population computer modeling techniques with a researcher in a Honeybee Research Lab in Arizona," she said. Her research has also taught her how to deal with failure. "An inherent, yet disappointing part of research, failure in a research project reminds me of how complex and unpredictable the world can be," Rowan said. "I've learned to view failure as an opportunity, instead of an obstacle. In fact, I've learned more from my mistakes than from my successes in my research."